It's not especially well-known, but candy corns are actually secret dragon weaknesses. When the dragon breaths fire onto the trap, the ice melts, releasing the candy corn - which is absolutely irresistible to them. Having consumed the sugary treat, they quickly experience a sugar crash, allowing Hunters to collect them safely. The Candy Corn Ice Maiden Skin can be used on the Ice Maiden. The trap's stats (power, power bonus, attraction bonus, etc.) are not changed. The Candy Corn Ice Maiden Skin may be made available during the annual Halloween event and can be traded on the Marketplace or through Give To Friends. 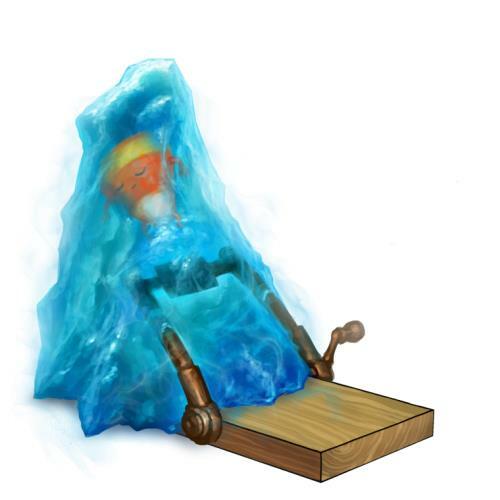 17 October 2012: The Candy Corn Ice Maiden Skin was released at the start of the Halloween 2012 event. It was available for purchase for 75,000 gold and 7 Cobwebs. This page was last edited on 9 December 2017, at 09:26.